DONALD HOLT REID (3 Jun 1927 – 20 Jun 2003) was born in Clinton, Davis County, Utah the first son of George Samuel Reid and LaVon Holt. Don married Beverly Jean Allen 9 Jun 1948 in Salt Lake City, Salt Lake County, Utah. Don and Bev have six children. Don and Bev lived in Roy, Weber County, Utah for much of their married life. They moved to Arizona for a brief time to enjoy their retired years until they returned to Utah where they could be closer to their children after Don’s health began to fail. Don died on 20 Jun 2003 in Ogden, Weber, Utah. He is buried in the Clinton City Cemetery, Clinton, Davis County, Utah. Donald H Reid passed away with his family at his side on June 20, 2003 at the age of 76 from an on-going illness of Parkinson ’s Disease. He is the son of George S. Reid and LaVon Holt Reid, born on June 3, 1927 in Clinton, Utah. He is survived by his wife, six children, 30 grandchildren and 22 great-grandchildren. His wife Beverly and children: Allen Reid, McCall, ID; Debra (Kenneth), Roy, UT; Becky Reid, Oren, UT; Chris (Lisa) Reid, Clinton, UT; Tammy (Evan) Parker, Hooper, UT; Scot (Shauna) Reid, Kaysville, UT. Also surviving are four brothers: C. Richard, G. Stephen, Paul, and Stanford. He was a prominent resident of Roy, Utah for 35 years and later became snowbirds for 14 enjoyable years in Surprise, Arizona. He was a Navy World War II veteran and retired from the Holbrook Company after many years of service. He was a member of the LDS Church serving in many capacities including Bishop, High Council, Ward Clerk, Stake YM Pres., and Boy Scout Leader. 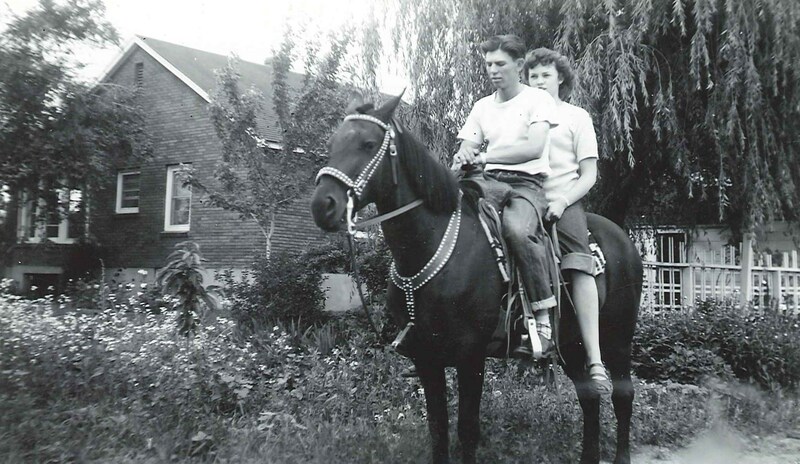 Don & Bev on horseback behind the George S Reid home - about 1947. He is known by many and loved by all who knew him. The family wishes to thank those who have lovingly cared for him at Manor Care, Hospice for Utah, and Hospice of the Valley in AZ and all his good friends and family who helped him through his illness. Funeral services will be held Tuesday, June 24, 2003 at 11 a.m. at the Roy 2nd Ward Chapel, 5127 South 2400 West with Bishop Chris Reid officiating. Friends may call on Monday from 6 to 8 p.m. at Myers Mortuary in Roy, 5685 South 1900 West and on Tuesday at the church from 9:30 to 10:45 a.m. prior to services. Internment, Clinton City Cemetery. 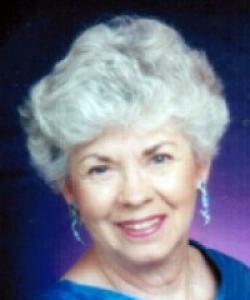 ROY – Beverly Jean Allen Reid passed peacefully away in her home on her sweetheart’s birthday Friday, June 3, 2011 surrounded by her loving family at the age of Eighty. Bev was born September 20, 1930 in Ogden Utah to Kenneth and Leona Wagstaff Allen; older sister to John K. (Jack) Allen. 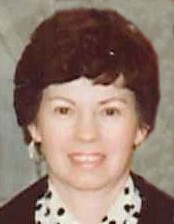 Beverly was an active member of The Church of Jesus Christ of Latter Day Saints serving in many capacities such as Primary President, Young Women’s Counselor, Relief Society Counselor, and especially enjoyed serving over 20 years as Home Making Leader in the Roy 2nd Ward. Bev and Don lived in Roy Utah for over 30 years. It was here where they raised their family of six children and she had many friends that she loved. After Don retired, they moved to Surprise Arizona during the winters where she enjoyed more friendships and returned to Utah for the summer months. Beverly had a zest for life and a love for the people around her. After the passing of her husband Don, she was diagnosed with Inclusion Body Myositis and slowly declined physically, yet continued to enjoy life with friends and family and developed an expertise in genealogy and family history work. Her passion to search out family ancestors brought countless blessings to many and is a great part of her life’s legacy. Beverly is survived by six children, George Allen Reid (McCall, Id), Debra (Kenneth) Arave (Roy), Becky Reid (Park City), Chris (Lisa) Reid (Clinton), Tamera Parker (Chris) Bell (Kaysville) and Scot (Shauna) Reid (Logan). She leaves behind 30 grandchildren, 38 great-grandchildren and 1 great-great-grandchild. She is also survived by her brother Jack, brothers’ in law Stephen (Pat) Reid, Paul (Colleen) Reid, Stan (Pattie) Reid and a special friend Loren Jensen. Bev was preceded in death by her husband Don, son-in-law Evan Parker, two grandchildren, brother in law Richard Reid and sisters’ in law Ila and Carolyn Reid. Funeral services will be held Monday, June 6, 2011 at 11:00 a.m., at Clinton 11th Ward, 1448 West 1800 North, Clinton, Utah. A viewing will be held Sunday, June 5, 2011 from 6:00 – 8:00 p.m., at Myers Roy Mortuary, 5865 South 1900 West, Roy, Utah, and on Monday from 9:45 – 10:45 a.m., prior to services at the church. My name is Faith Paulsen. I am one of Don and Bev’s great grand children. My Father is Michael Reid Paulsen, (son of Becky). He is in the U.S. Military and he was sealed in the London Temple just last year (September 26, 2009) to his wife (Billie Joe Paulsen) and Children (myself, John Michael Paulsen, and Elijah James Paulsen). I am 13 years old, I was baptized when I was 11 on the day before Easter. I have always been interested in genealogy, thank you for all the work you have done for my Family. Thank you for your note – it’s great to hear from you. Hope your family is doing well. Not sure you’re still in England, but it’s a wonderful place. Your great great grandparents lived and died in Longborough located in the Cotswalds region of England. Most of the family history work within your family was started by the names kept within an old family Bible that was treasured and handed down to your Great Grandmother Reid. This Bible spent many years in the Wagstaff home in Longborough. The interesting thing is that you will likely not find this small town on the map. We found it only by accident and had the opportunity to walk the streets and visit the old church where they attended. Little has changed within this small town since the 12th century and so it felt like I was there among them. If possible, it may be worth a trip up north. Perhaps we’ll see you soon. Love, your Great Uncle Scot Reid.